Some roots run deep, threading through generations until they become embedded in a culture itself. That’s the story of Meghan Proctor. A story begun over a century ago when the Navajo tribe brought silversmithing to the Southwestern United States. It is in this tradition that Meghan’s father learned his craft from a jeweler in the Navajo Nation, a reservation nestled in northwestern New Mexico. A tradition Meghan herself entered at the age of six, taught at home by her father. And it is in this moment that Meghan discovered her life’s work – which would lead to custom pieces created for celebrities ranging from Celo Green to the co-founder of Home Depot. 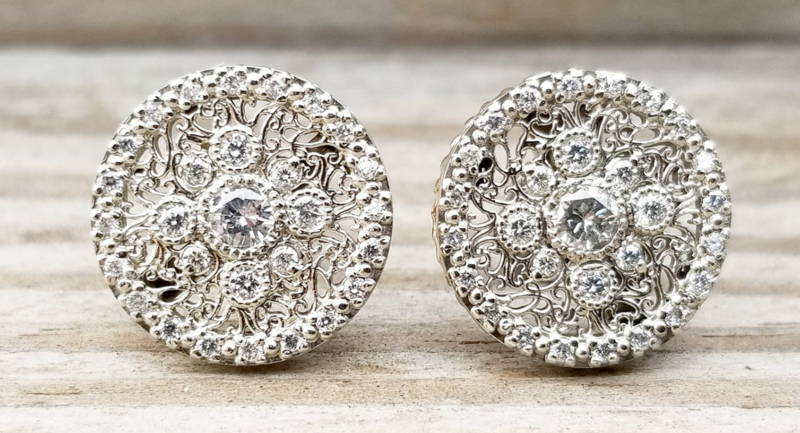 When Meghan's family moved to Georgia in 1992, her father, Rick Hubbell, and her mother, Lee Ann, pooled their savings and opened their first storefront, Hubbell Jewelry Design, with custom work done for luminaries like Magic Johnson – all hand-carved. Meghan loved working with her father, but she wanted to see the industry through a larger lens and decided to strike out on her own. Meghan not only saw custom craftsmanship in a different light. For the first time, she also experienced a whole different set of craftsman tools. Here, Meghan worked with a B9Creator 3D printer, and loved its versatility and speed. Before too long Meghan came back to the fold – a master jeweler in her own right – and joined her father once again to take Hubbell Jewelry Design to a whole new level. How did you make the leap from hand-carving to 3D printing? Did you have any reservations? At first I was against everything digital. I was against CAD and against 3D printing because we’ve always hand carved everything. But with hand carving there are a lot of remakes. It takes me a week hand carving to get it done. My dad wanted to get a 3D printer. He loves new gadgets. And I’d worked with a B9Creator at my last place of employment. So when I got back to the family business, we decided to buy a B9 Core Series. I could sing this machine’s praises all day. That’s the honest truth. I would not have been able to do half the things I do without it. I would never be able to get that detail into hand-carving a piece. And then if you break it, you might as well just go drink your sorrows, and get up the next day and start over. Last week, when I casted a pair of earrings, one of the earrings did not come out. I was able to come in here and grow another in 12 minutes. I didn’t know it was that fast! I re-casted it, and it was perfect. How has your jewelry business evolved? We’ve been open 26 years. We don’t advertise. Everything we do is word of mouth, and we get a lot of it. We have customers who have been coming to us since day one. A guy came in yesterday and ordered an anniversary gift for his wife. We’ve made every piece of jewelry she’s ever worn since we opened our doors. Custom is the way the go. Trends fade and custom does not. There were times with the economy when custom has kept our doors open and our lights on. It’s stood the test of time. It’s why we’re still here. Customers want something very unique and different, something nobody else has. Sometimes they bring in a Pinterest picture, or they say, "Here's what I have, I trust you to make something unique with it." Something like this one-of-a kind stunner, an award-winning piece that took home the Georgia Jewelers Association "Jeweler's Choice Award 2018." 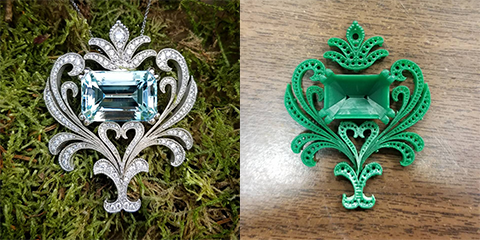 The 27-carat aquamarine pendant in white gold was created with the help of the B9 Core 530 and Emerald resin. With the B9 Core Series' speed, resolution, and ease-of-use, business is booming. Since we’ve purchased the B9 Core 530, I've gotten 16 custom jobs in the last 2-3 weeks because it's so fast. I got 4 more just today. I get things done with a custom ring, from CAD to cast, in 2-3 days. In this day and age, it's how soon can I get it, and the money is coming more and more from custom work. Plus we're cutting out a lot of vendors doing everything in-house, so we can keep costs down for the customer, and we're profiting more. It's always been my dream to have a store full of our own things. Now I'm designing our own bridal line. I plan on buying my dad out in the next 5 years, building a bigger store and changing location and growing my business. And I'll get a couple more of these B9 Core Series, too.